A big chunk of women tends to ignore their underarms for the simple reason that they don’t wear a sleeveless outfit. They feel why to bother about darkening underarms when no one gets to see them, except me, myself in the mirror?? But kid you not, underarms are a part of your beauty and need TLC (Tender Love and care) from you, as much as any other part of your body. So if you have been ignoring your underarm twins, here are some quick home remedies to help you lighten, whiten and brighten your underarms skin. But before that let us share some No-Nos for underarms. Common mistakes we commit without understanding the damage. Never shave in the underarm area – the skin is loose and very tender, which hardens because of shaving. Shaving rashes can also develop in this tender area causing severe discomfort for days. Do not apply a perfume or deodorant directly onto the skin of your underarms (no matter how much they advertise that in the TV Commercials). Especially Deodorants, as they have chemicals that can blacken the skin and cause rashes or irritation. Using hair removal creams for removing underarm hair is also a NO-NO as the chemicals in them can cause rashes, blackening and affect the skin severely. Allow underarm skin some open time, which means some time where you do not wear anything very tight. Rinse your underarms with plain water, wipe gently and allow the sweat and moisture to dry out completely, ON A DAILY BASIS. If you sweat a lot, spend some time letting your underarm skin breathe for few times a day, as this can help you get rid of bacteria infestations that cause foul body odor, rashes and itching. 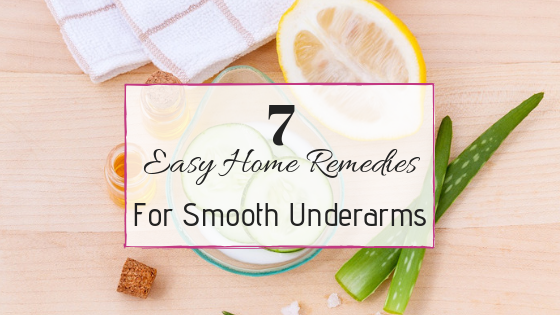 Here are some tried and tested, smooth underarm beauty tips, with ingredients easily available in your house. This remedy never gets redundant. Mix a tablespoon of gram flour or besan with a tablespoon of cream obtained from milk (malai) and mix them well. Add in some drops of rose water if the smell of besan is unappealing to you. Apply this paste on your underarm skin and let dry for 5-7 minutes. Once it is halfway dried up, scrub and remove the paste from your skin. Avoid doing this when you have a decent amount of underarm hair growth. You may try this remedy as often as you like, and it is best practiced before bath time. Grate half a potato and place some of it on your underarm skin. Let it stay on the skin for 10 minutes or until the juices dry up, before you rinse it off. Potato has natural bleaching properties which help in lightening up your underarm skin. This one is a double whammy!! All you need is a cucumber and some rock salt. Cut up two medium thick slices from the cucumber and place them on your underarm skin. Are you wondering what to do with the salt?? Apply it on the rest of the cucumber and chomp it up while you wait for your underarms to brighten and freshen up with the two slices! Perfect summer remedy, isn’t it? Take a handful of fresh neem leaves in a grinder, toss in a teaspoonful of turmeric and add some water or rose water to make it easy to grind this mix. Apply this paste onto your underarm skin and let it dry and then rinse and wipe clean with a towel. Both neem and turmeric are known for killing bacteria and provide skin that feels fresh. For this pack, you will need to dry up some orange peels in the sun. Once they have completely dried, grind them into a fine powder and store it in a bottle for future use. Take a tablespoon of the orange peel powder and mix it with enough yogurt to make it into a paste – like consistency. Apply this pack on your underarm skin and let it dry. Once it dries, rinse with water and wipe with a clean towel. The yogurt removes discoloration while orange peel kills bacteria and provides a good fragrance. In a bowl, extract the juice of half a lemon. To this, add 2-3 teaspoons of granulated sugar and mix well. This would dissolve some granules while some granules will be intact. If all your sugar dissolves, add another teaspoon to the mix, as we need a coarse texture for this scrub. Apply this scrub to your underarm skin and let it dry somewhat for about 10 minutes. Then scrub in circular motions until it becomes too thick to scrub. Then rinse it with lukewarm water and dry with a clean hand towel. Avoid this scrub if you have considerable underarm hair growth. Olive oil is great for moisturizing and lightening the skin. Dab some olive oil on your palm and massage in circular motion for 5-10 minutes. This remedy is best used after a wash and before bedtime. Use a small amount of oil as too much oil can make your underarm skin perspire excessively. Leave the oil on your skin overnight for magical results. Along with using these tips and remedies, it is important to use a gentle soap that does not dry up your skin too much, as it may cause irritation and blackening of the skin. We hope that these remedies help you get better skin. Do try these and let us know which of these remedies worked the best for you. If you liked this article, Plz SHARE it ahead! these are some really easy tips that can be incorporated easily in our weekly routine, willl surely let you know how it turned out for me. Great tips honey, I never use a deo directly on this sensitive part of the skin. Also lemon and sugar scrub is what I have been using it, as my mum recommended it when we were teens. I agree underarms is completely ignored by many. These are some simple solutions that sound effective. This is so true, i often ignore my underarms and shaved them too a couple of times, would try out these easy remedies you have put out there. Natural stuff works for me the best. The besan and cream one I vouch for it too, ome of the best home remedies with multiple benefits. These are some amazing hacks for smoother underarms. Another tip my granny gave was massaging with coconut oil. Your posts are always helpful. I agree with you, perfumes & deos should not applied directly as it can cause skin irritation. And i will follow this easy remedies for sure. I had no idea that one can keep underarms smooth by using these things. Nice remedies. I like diy tips that can be done using ingredients from our own kitchen. I need to try besan one and the potato slices one. Thanks for sharing.